To better compete within the soap industry, Proctor & Gamble sought to create a high quality, affordable, duel bath bar and laundry product. In 1878, the first successful formula was created and produced under the name of White Soap. Rumor has it that the floating soap formula was invented accidentally by one of the Proctor & Gamble’s employees. In 1879, an unknown soap maker left the mixer unattended and running while out for lunch. A batch of White Soap had been over-whipped and unusual amounts of air found its way into the mixture. The soap mixture continued through the rest of the production process and was shipped for consumers. Soon after, company officials began receiving letters requesting more floating soap. The addition of whipped air to the mixture made the soap lighter than water, so it floated. This is a nice story of a mistake becoming one of Proctor & Gamble’s most successful products, but is it true? According to Proctor & Gamble’s company archivist, Ed Rider, this is a false wives’ tale. Rider had found documentation that a chemist, James N. Gamble, created the floating soap formula. In a document, James Gamble noted “I made floating soap today. I think we’ll make all of our stock that way.” The floating soap had incredible marketing potential and small amounts of air were intentionally whipped into the mixture. This process also produced a smooth textured bar of soap that was easy to lather. While listing to a sermon, Harley Proctor received inspiration for the name of this soap from Psalm 45:8, “All thy garments smell of myrrh and aloes and cassia out of ivory palaces whereby they have made thee glad.” The popular floating shower accessory would be named Ivory. 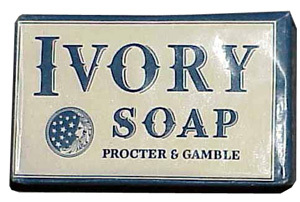 Proctor & Gamble registered for a trademark on Ivory Soap on September 23, 1879 and received trademark number 7,701. In 1882, Ivory was one of the first brands to have scientific researched based advertising. Harley Procter wrote the slogan “99-44/100% Pure: it floats” after a sample analysis of contents against the best Castile soaps (the leading competitor at the time). A sample of Ivory soap was sent to college chemistry professors and independent laboratories. Proctor totaled the pure soap ingredient percentages (0.56%) and subtracted it from 100%, and was left with 99.44%. Compared to castile soap, Ivory’s 99.44% had a higher purity ratio by this measurement. This slogan is a registered trademark with the US Trademark Office. The floating soap bar was an immense hit because it could easily be found in bathtubs and wash buckets. 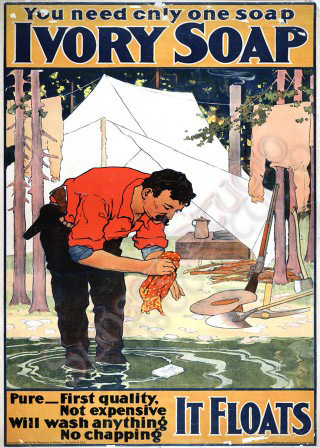 The excitement from consumers led “It Floats” to become the soap’s shorted slogan in 1891. Today, the Ivory name is a parachute over different soap formulas, including bar soaps that float and those that do not. If heated in the microwave, Ivory soap will expand more than six times the size of its’ original form. This practice is often used to demonstrate Charles’ Law, closed-cell foam formation and physical change. Over 130 years after the invention of Ivory soap, Americans have used 40 billion bars of Ivory soap. If uniformly lined up, the bars would amount to a length of 2,525,253 miles long or circle around the earth almost 101 ½ times. This was a great article. I’ve always believed the accident story about ivory. I always wondered if the guy got fired, like the boy that invented Dr. Pepper eventually was. I appreciate the truth, but I still like the story. It could have happened. A lot of great inventions were mistakes; that’s why I keep making them. I’m hoping I’ll make a great discovery some day. Thanks, Randy! Honestly, it never ceases to surprise me how many great inventions have serendipitous beginnings. And that was a good story – believable though it turned out to be a myth! I like your idea about making mistakes, by the way. Best of luck stumbling into the next big thing! !